What will Artificial Intelligence (AI) mean for society? That’s the question scholars from a variety of disciplines will explore during the inaugural Summer Institute on AI Societal Impacts, Governance, and Ethics. Summer Institute, co-hosted by the Alberta Machine Intelligence Institute (Amii) and CIFAR, with support from UCLA School of Law, takes place July 22-24, 2019 in Edmonton, Canada. Summer Institute brings together experts, grad students and researchers from multiple backgrounds to explore the societal, governmental, and ethical implications of AI. A combination of lectures, panels, and participatory problem-solving, this comprehensive interdisciplinary event aims to build understanding and action around these high-stakes issues. Over the three-day program, 30 graduate-level students and early-career researchers will engage with leading experts and researchers including event co-organizers: Western University’s Daniel Lizotte, Amii’s Alona Fyshe and UCLA’s Edward Parson. Participants will also have a chance to shape the curriculum throughout this uniquely interactive event. Summer Institute takes place prior to Deep Learning and Reinforcement Learning Summer School, and includes a combined event on July 24th  for both Summer Institute and Summer School participants. Visit dlrlsummerschool.ca/the-summer-institute to apply; applications close April 7, 2019. View our Summer Institute Biographies & Boilerplates for more information on confirmed faculty members and co-hosting organizations. Follow the conversation through social media channels using the hashtag #SI2019. Two questions, why are all the summer school faculty either Canada- or US-based? What about South American, Asian, Middle Eastern, etc. thinkers? One last thought, I wonder if this ‘AI & ethics summer institute’ has anything to do with the Pan-Canadian Artificial Intelligence Strategy, which CIFAR administers and where both the University of Alberta and Vector Institute are members. This entry was posted in ethics, regulation, robots, social implications and tagged Alberta Machine Intelligence Institute (Amii), Alona Fyshe, artificial intelligence (AI), Canadian Institute for Advanced Research (CIFAR), Daniel Lizotte, Edward Parson, Gary Marchant, Geoffrey Rockwell, governance, Graham Taylor, John Shilllington, machine intelligence, Pan-Canadian Artificial Intelligence Strategy, Rand Corporation, Rob Lempert, Summer Institute on AI Societal Impacts Governance and Ethics, UCLA, University of Alberta, University of California at Los Angeles, University of Guelph, Vector Institute, Western University on March 29, 2019 by Maryse de la Giroday. This is strictly for folks who have media accreditation. First, the news about the summit and then some detail about how you might accreditation should you be interested in going to Switzerland. Warning: The International Telecommunications Union which is holding this summit is a United Nations agency and you will note almost an entire paragraph of ‘alphabet soup’ when all the ‘sister’ agencies involved are listed. Artificial Intelligence (AI) h​as taken giant leaps forward in recent years, inspiring growing confidence in AI’s ability to assist in solving some of humanity’s greatest challenges. Leaders in AI and humanitarian action are convening on the neutral platform offered by the United Nations to work towards AI improving the quality and sustainability of life on our planet. The 2017 summit marked the beginning of global dialogue on the potential of AI to act as a force for good. The action-oriented 2018 summit gave rise to numerous ‘AI for Good’ projects, including an ‘AI for Health’ Focus Group, now led by ITU and the World Health Organization (WHO). The 2019 summit will continue to connect AI innovators with public and private-sector decision-makers, building collaboration to maximize the impact of ‘AI for Good’. Media are recommended to register in advance to receive key announcements in the run-up to the summit. Confirmed speakers also include C-level and expert representatives of Bosch, Botnar Foundation, Byton, Cambridge Quantum Computing, the cities of Montreal and Pittsburg, Darktrace, Deloitte, EPFL, European Space Agency, Factmata, Google, IBM, IEEE, IFIP, Intel, IPSoft, Iridescent, MasterCard, Mechanica.ai, Minecraft, NASA, Nethope, NVIDIA, Ocean Protocol, Open AI, Philips, PWC, Stanford University, University of Geneva, and WWF. The summit is organized in partnership with the following sister United Nations agencies:CTBTO, ICAO, ILO, IOM, UNAIDS, UNCTAD, UNDESA, UNDPA, UNEP, UNESCO, UNFPA, UNGP, UNHCR, UNICEF, UNICRI, UNIDIR, UNIDO, UNISDR, UNITAR, UNODA, UNODC, UNOOSA, UNOPS, UNU, WBG, WFP, WHO, and WIPO. Applications for accreditation are considered on a case-by-case basis and ITU reserves the right to request additional proof or documentation other than what is listed below. ​​​Media accreditation decisions rest with ITU and all decisions are final. o please submit 2 copies or links to recent byline articles published within the last 4 months. o please submit 2 copies or links to recent byline articles or broadcasting material published within the last 4 months. o please submit broadcasting material published within the last 4 months. Freelance journalists and photographers must provide clear documentation that they are on assignment from a specific news organization or publication. Evidence that they regularly supply journalistic content to recognized media may be acceptable in the absence of an assignment letter and at the discretion of the ITU Corporate Communication Division. o if possible, please submit a valid assignment letter from the news organization or publication. Obtaining media accreditation for ITU events is an opportunity to meet and interact with key industry and political figures. While continued accreditation for ITU events is not directly contingent on producing coverage, owing to space limitations we may take this into consideration when processing future accreditation requests. Following any ITU event for which you are accredited, we therefore kindly request that you forward a link to your post/podcast/video blog to pressreg​@itu.int. Bloggers who are granted access to ITU events are expected to act professionally. Those who do not maintain the standards expected of professional media representatives run the risk of having their accreditation withdrawn. You can register and get accreditation here (scroll past the guidelines). Good luck! This entry was posted in robots and tagged (UN) Sustainable Development Goals (SDGs), 2019 AI for Good Global Summit, Anousheh Ansari, artificial intelligence (AI), Association for Computing Machinery (ACM), Baidu, Cédric Villani, Google, International Telecommunications Union (ITU), Jean-Philippe Courtois, Jim Hagemann Snabe, Jojo Mayer, Lucas di Grassi, Microsoft, Red Cross, Reeps One, Roborace, Siemens, Timnit Gebru, United Nations, University of Cambridge, Vicki Hanson, Vladimir Kramnik, XPRIZE Foundation, Yan Huang, Yves Daccord, Zoubin Ghahramani on March 28, 2019 by Maryse de la Giroday. AI (artificial intelligence) text generator, too dangerous to release? Recycling is good for the world. NO! YOU COULD NOT BE MORE WRONG!! Recycling is NOT good for the world. It is bad for the environment, it is bad for our health, and it is bad for our economy. I’m not kidding. Recycling is not good for the environment. It is destructive to the earth and it is a major contributor to global warming. Recycling is not good for our health. It contributes to obesity and diseases like heart disease and cancer. Recycling is bad for our economy. It increases the cost of a product, and in turn, the price of everything that is made with that product. Recycling is not good for our nation. We pay a tremendous price for the privilege of having the world’s most advanced and efficient recycling system. Recycling is a huge, colossal waste of time, energy, money, and resources. And THAT is why we need to get back to basics and get back to basics in our recycling efforts. One of the best ways to start is to look at the process of creating a paper product. When you make a paper product, it is basically a long chain of materials. Everything from the raw materials (wood, cardboard, paper, etc. ), to the reagents (dyes, solvents, etc.) to the printing equipment (chemicals, glue, paper, ink, etc. ), to the packaging, to the packaging materials (mercury, chemicals, etc.) to the processing equipment (heating, cooling, etc. ), to the packaging materials, to the packaging materials that are shipped overseas and to the packaging materials that are used in the United States. Each step along the way creates tons of waste that we constantly have to clean up. The process of making a paper product is a very wasteful one. But the end result is something that all of us need to consume. And if we want to keep the recycling process running efficiently, then we really need to think about each and every step that goes into making a paper product. The first few sentences don’t work for me but once the discussion turns to making paper products, then it becomes more convincing to me. As to whether the company’s reluctance to release the research is genuine or a publicity stunt, I don’t know. However, there was a fair degree of interest in GPT2 after the decision. When used to simply generate new text, GPT2 is capable of writing plausible passages that match what it is given in both style and subject. It rarely shows any of the quirks that mark out previous AI systems, such as forgetting what it is writing about midway through a paragraph, or mangling the syntax of long sentences. OpenAI is funded by contributions from a group of technology executives and investors connected to what some have referred to as the PayPal “mafia”—Elon Musk, Peter Thiel, Jessica Livingston, and Sam Altman of YCombinator, former PayPal COO and LinkedIn co-founder Reid Hoffman, and former Stripe Chief Technology Officer Greg Brockman. [emphasis mine] Brockman now serves as OpenAI’s CTO. Musk has repeatedly warned of the potential existential dangers posed by AI, and OpenAI is focused on trying to shape the future of artificial intelligence technology—ideally moving it away from potentially harmful applications. Given present-day concerns about how fake content has been used to both generate money for “fake news” publishers and potentially spread misinformation and undermine public debate, GPT-2’s output certainly qualifies as concerning. Unlike other text generation “bot” models, such as those based on Markov chain algorithms, the GPT-2 “bot” did not lose track of what it was writing about as it generated output, keeping everything in context. For example: given a two-sentence entry, GPT-2 generated a fake science story on the discovery of unicorns in the Andes, a story about the economic impact of Brexit, a report about a theft of nuclear materials near Cincinnati, a story about Miley Cyrus being caught shoplifting, and a student’s report on the causes of the US Civil War. Each matched the style of the genre from the writing prompt, including manufacturing quotes from sources. In other samples, GPT-2 generated a rant about why recycling is bad, a speech written by John F. Kennedy’s brain transplanted into a robot (complete with footnotes about the feat itself), and a rewrite of a scene from The Lord of the Rings. There were some weak spots encountered in GPT-2’s word modeling—for example, the researchers noted it sometimes “writes about fires happening under water.” But the model could be fine-tuned to specific tasks and perform much better. “We can fine-tune GPT-2 on the Amazon Reviews dataset and use this to let us write reviews conditioned on things like star rating and category,” the authors explained. For decades, machines have struggled with the subtleties of human language, and even the recent boom in deep learning powered by big data and improved processors has failed to crack this cognitive challenge. Algorithmic moderators still overlook abusive comments, and the world’s most talkative chatbots can barely keep a conversation alive. But new methods for analyzing text, developed by heavyweights like Google and OpenAI as well as independent researchers, are unlocking previously unheard-of talents. OpenAI’s new algorithm, named GPT-2, is one of the most exciting examples yet. It excels at a task known as language modeling, which tests a program’s ability to predict the next word in a given sentence. Give it a fake headline, and it’ll write the rest of the article, complete with fake quotations and statistics. Feed it the first line of a short story, and it’ll tell you what happens to your character next. It can even write fan fiction, given the right prompt. The writing it produces is usually easily identifiable as non-human. Although its grammar and spelling are generally correct, it tends to stray off topic, and the text it produces lacks overall coherence. But what’s really impressive about GPT-2 is not its fluency but its flexibility. This algorithm was trained on the task of language modeling by ingesting huge numbers of articles, blogs, and websites. By using just this data — and with no retooling from OpenAI’s engineers — it achieved state-of-the-art scores on a number of unseen language tests, an achievement known as “zero-shot learning.” It can also perform other writing-related tasks, like translating text from one language to another, summarizing long articles, and answering trivia questions. GPT-2 does each of these jobs less competently than a specialized system, but its flexibility is a significant achievement. Nearly all machine learning systems used today are “narrow AI,” meaning they’re able to tackle only specific tasks. DeepMind’s original AlphaGo program, for example, was able to beat the world’s champion Go player, but it couldn’t best a child at Monopoly. The prowess of GPT-2, say OpenAI, suggests there could be methods available to researchers right now that can mimic more generalized brainpower. Despite this, programs that perform text prediction are quite common. You’ve probably encountered one today, in fact, whether that’s Google’s AutoComplete feature or the Predictive Text function in iOS. But these systems are drawing on relatively simple types of language modeling, while algorithms like GPT-2 encode the same information in more complex ways. The difference between these two approaches is technically arcane, but it can be summed up in a single word: depth. Older methods record information about words in only their most obvious contexts, while newer methods dig deeper into their multiple meanings. So while a system like Predictive Text only knows that the word “sunny” is used to describe the weather, newer algorithms know when “sunny” is referring to someone’s character or mood, when “Sunny” is a person, or when “Sunny” means the 1976 smash hit by Boney M.
The success of these newer, deeper language models has caused a stir in the AI community. Researcher Sebastian Ruder compares their success to advances made in computer vision in the early 2010s. At this time, deep learning helped algorithms make huge strides in their ability to identify and categorize visual data, kickstarting the current AI boom. Without these advances, a whole range of technologies — from self-driving cars to facial recognition and AI-enhanced photography — would be impossible today. This latest leap in language understanding could have similar, transformational effects. Hern’s article for the Guardian (February 14, 2019 article ) acts as a good overview, while Gallagher’s ars Technical posting (February 15, 2019 posting) and Vincent’s article (February 14, 2019 article) for the The Verge take you progressively deeper into the world of AI text agents. For anyone who wants to dig down even further, there’s a February 14, 2019 posting on OpenAI’s blog. This entry was posted in robots, science, writing and tagged AI text generator, Alex Hern, algorithms, artificial intelligence (AI), Elon Musk, GPT2, Greg Brockman, James Vincent, language modeling, Mark Fraunfelder, OpenAI, Peter Thiel, Reid Hoffman, Sean Galagher, Sebastian Ruder on February 18, 2019 by Maryse de la Giroday. Cornell University researchers have developed a prototype of a robot that can express “emotions” through changes in its outer surface. The robot’s skin covers a grid of texture units whose shapes change based on the robot’s feelings. Assistant professor of mechanical and aerospace engineering Guy Hoffman, who has given a TEDx talk on “Robots with ‘soul'” said the inspiration for designing a robot that gives off nonverbal cues through its outer skin comes from the animal world, based on the idea that robots shouldn’t be thought of in human terms. 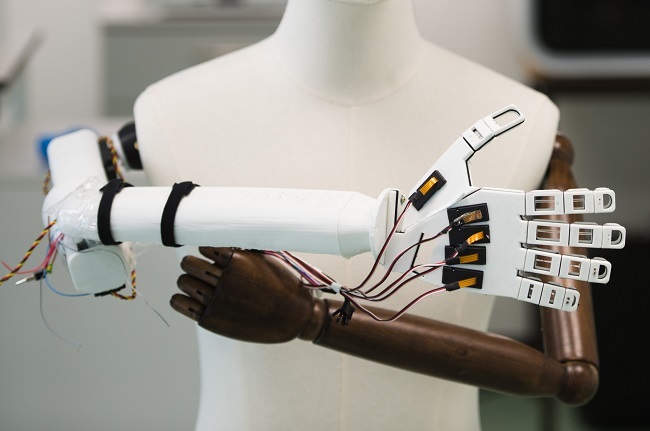 Their work is detailed in a paper, “Soft Skin Texture Modulation for Social Robots,” presented at the International Conference on Soft Robotics in Livorno, Italy. Doctoral student Yuhan Hu was lead author; the paper was featured in IEEE Spectrum, a publication of the Institute of Electrical and Electronics Engineers. In 1872, Charles Darwin published his third major work on evolutionary theory, “The Expression of the Emotions in Man and Animals,” which explores the biological aspects of emotional life. You can find the paper presented at the International Conference on Soft Robotics in Livorno, Italy, ‘Soft Skin Texture Modulation for Social Robotics’ by Yuhan Hu, Zhengnan Zhao, Abheek Vimal, and Guy Hoffman, here. This entry was posted in robots and tagged ] visual modalities, Abheek Vimal, animals, Charles Darwin, Cornell Universit, emotions, evolutionary theory, facial expressions, gestures, Guy Hoffman, haptic modalities, International Conference on Soft Robotics, nonverbal cues, robot skin, robots as another species, Robots with soul, social interaction, social robots, Soft Skin Texture Modulation for Social Robots, surface textures, texture-changing skin, The Expression of the Emotions in Man and Animals, Tom Fleischman, touch, US, Yuhan Hu, Zhengnan Zhao on February 14, 2019 by Maryse de la Giroday.